Family and friends, along with stars of TV, radio and sport, gathered to celebrate the launch of the new independent café on Thursday 7 September 2017. 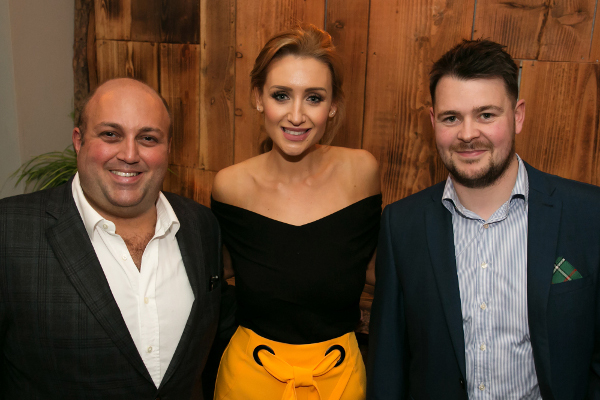 Stars at the launch included Coronation Street’s Catherine Tyldesley, hot-footing it from The TV Choice Awards which took place earlier in the week, along with BBC 6 Music presenter and Celebrity Mastermind star Chris Hawkins. This is the first business venture for owners Daniel McDonald and Ben Rose, and follows an extensive six week internal refurbishment and installation of an outside heated seating area and children’s play corner, The Laughing Elephant Café is now fully open for business. The independently-owned Hale Road café focuses on providing freshly-made and locally-produced food and is already proving a firm favourite with locals. Dishes included smoked salmon, avocado and cucumber salad, braised oxtail and dumplings, sea bass, braised lamb shank. Sweet treats included plum crumble, chocolate mousse and elderflower and autumn berry trifle. Co-owner Daniel McDonald said: “We’re really excited to officially launch The Laughing Elephant Café, surrounded by our family and friends. “We make and serve only locally-sourced food and are committed to our goal, which was to open a venue that serves excellent, restaurant quality dishes at affordable prices. On Thursday, Friday and Saturday evenings* the restaurant turns into a cosy bistro, with a carefully selected and executed ‘Best of British’ menu. The Laughing Elephant is a very nice village cafe who pride themselves on serving fresh, locally sourced food as well as hot and cold drinks. Open daily, the menu changes with the seasons - along with any feedback you may have!